This mailbag yielded plenty of questions about Kellen Moore. I got a laugh out of the notion that Jason Garrett isn’t allowed to do anything without Jerry Jones’ permission; it’s amusing but not entirely ridiculous. I’ll also tell you as much about the Cowboys’ draft plans as they could tell you themselves in early February: Not a ton. What, in your estimation, are the Cowboys’ top 8-10 priorities this offseason? Will they accomplish each one? Every team has priorities. It’s difficult to achieve them all, and the Cowboys are not exempt from that rule. Here’s how I would list them in order of importance. Re-sign DeMarcus Lawrence; he’s the team’s best player. Extend Dak Prescott and ignore the noise from the fans who say he’s not worth it. Draft a defensive tackle or safety in the second round because those are areas of need. I’m not big on signing Earl Thomas. Sign a veteran wide receiver in free agency. The Cowboys tried this last year but the two main signings, Deonte Thompson and Allen Hurns, were disappointments. Cut Sean Lee to save $7 million. The Cowboys have Leighton Vander Esch and Jaylon Smith now and the future is bright. Cut Terrance Williams to save $2.2 million. He doesn’t want to play for the Cowboys anymore and hasn’t performed since signing his latest contract. Wait until training camp before opening contract talks with Amari Cooper. The Lawrence and Prescott deals may dictate a lot. Make sure Connor Williams gains 20 pounds; he needs the bulk. He’s an undersized lineman on a line that needs bulk. Draft a tackle to improve the depth at the position. Tyron Smith’s decline has begun, and after back issues, that decline rarely slows down. Try not to upset Zeke Elliott, who wants a long-term deal this summer. The Cowboys should wait a year on him, given the landscape for running backs. Some guys show loyalty, some guys do not. That’s fine. Get yours while you can. With that said, if Dallas is not willing to shell out big money for (Cole) Beasley, does he take a hometown discount to stay or do you foresee him in another uniform next season? Cole Beasley is gone. He wasn’t a happy camper the last two seasons given how he was used in the offense. Beasley is an effective slot receiver but believes he’s better than what he is. He’s not a featured receiver and I doubt any team will give him big money in free agency. 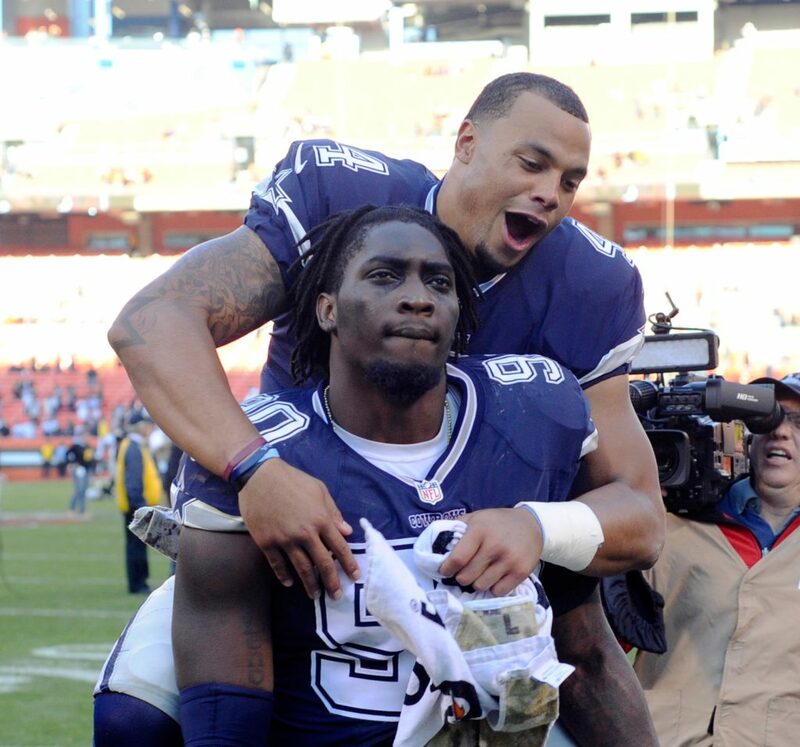 If I were Beasley, I’d try to coax a contract out of the Cowboys. But he wants a fresh start somewhere, and I respect that. Is there one player in particular that the coaching staff or front office is expecting to make a leap or to stand out between now and the start of training camp? And not so much the obvious ones, like Williams with putting on strength or (Michael) Gallup expanding his route tree. But maybe guys like Cedric Wilson or Chris Covington? Here’s why the Cowboys are hesitant to draft a tight end: Blake Jarwin. The second-year tight end caught seven passes for 119 yards with three touchdowns in the regular-season finale against the Giants. Was it a mirage? Was it a sign of things to come? The Cowboys like Jarwin’s pass-catching ability. His blocking leaves room for improvement, but it did show signs of progress throughout the season. Jarwin may not currently be better than Geoff Swaim (now a free agent) but has more upside. This will be a big offseason for Jarwin. Hi Calvin. After DeMarcus Lawrence, who do you think the Cowboys tie-up out of the bigger names i.e. Amari Cooper, Dak Prescott, Ezekiel Elliott, Byron Jones. Cooper and Jones will both be on their 5th-year option next season, and Dak is in his last year, but it has been mentioned Zeke may want a new contract now even though he has 2 years remaining on his rookie deal. Byron Jones was No. 11 on my 10-item priority list. Jones and Cooper will most likely get new contracts during training camp. The interesting thing to consider in regard to the Cowboys’ cap space is Ezekiel Elliott’s place. His reps are expecting a new contract at some point this offseason and know the Cowboys are flexible enough to grant him one right now. Elliott wants his money sooner rather than later, and with the delicate nature of the running back position he has a valid point. Todd Gurley might provide a cautionary tale for teams and running back contracts. Gurley, who’s only 24, has the largest contract at his position and wasn’t fully healthy for the last two weeks of the regular season and the postseason. The Rams needed Gurley but he just couldn’t find the spark that made him one of the top players at his position. You could also blame Sean McVay for not using him more, but it was clear Gurley wasn’t healthy. It makes sense for Elliott’s camp to seek out a new contract today rather than tomorrow. The Cowboys want to take care of their running back, but they have two more years of contractual control and can use the franchise tag after that. It that game worth alienating one of the team’s best players? The answer is yet to come. Jerry Jones has been quoted as saying he expects ‘creativity’ from his newly appointed coaches and if it’s not being implemented they should call him. Can he do anything else to tell the world that Jason Garrett is HC in name only? If the changes don’t work does Jerry take responsibility? Jerry Jones is the owner and general manager. He doesn’t need to take responsibility for what goes on with the offense because that’s Jason Garrett’s job. If the offense fails in 2019, that would mean Garrett is out of a job and Jones will hire his seventh coach since firing Jimmy Johnson following two Super Bowl titles. Garrett was hired back in 2007 as an up-and-coming offensive mind to bring creativity to the offense. Kellen Moore got promoted to offensive coordinator for the same reason. As I said, if things fall apart, Garrett is out of a job and Jones will hire someone else. Coaching the Cowboys is a difficult job, considering Jones’ personality and involvement. It’s been that way for years, even when Bill Parcells was the head coach. The key for any coach — and Garrett does a good job with this — is managing Jerry in certain situations and using his son Stephen to help out with major decisions. What positions do you think Dallas needs and can fill via the draft? Are there any players you think they should specifically target with their picks? It’s just too early to project who the Cowboys will draft in April. I really don’t play these guessing games with the draft because it serves little purpose. NFL teams have no idea who they’re picking now and won’t be sure until they’re on the clock. However, The Athletic has one of the better draft experts in the business in Dane Brugler; here’s his latest mock. As far as needs go, I’d say the Cowboys should target a defensive tackle in the second round. This is a heavy draft for defensive linemen and the Cowboys need to find one. Will Terrance Williams ever play for the Cowboys again? Nope. He’s done. Williams should get some credit for returning from foot surgery but his suspension and the Cowboys moving away from him in the offense just bothered him too much. Williams was healthy enough to play, but the Cowboys just decided to move on. The savings the Cowboys gain from releasing him ($2.2 million) will be needed for them to achieve their financial goals this season. Williams was mainly used as a blocking receiver early in the season and worried about a then-pending suspension for a violation of the NFL conduct policy. Williams had his moments early in his career with the Cowboys but when Dez Bryant went down with his injuries in 2017, he failed to establish himself as a major threat in the offense. The Cowboys should trade up and get DK Metcalf. Instant Contenders. The Ole Miss receiver suffered a season-ending neck injury that limited him to seven games. He was productive in those games, hauling in five touchdowns and 569 yards, but I’m not sure if he’ll make a major impact. For what it’s worth, Dane has him going 22nd to Baltimore. That would require one heck of a trade up. He’s not worth it and Cowboys officials don’t believe any wide receiver in this upcoming draft has the talent of being a No. 1 receiver. Last year, the Cowboys felt Calvin Ridley of Alabama, considered the best receiver in the draft, wasn’t a No. 1 offensive threat in the passing game. So they went in another direction. The trade for Amari Cooper, which cost Dallas its first-round pick, gave the team what it considers an elite pass-catcher. If the Cowboys draft a wide receiver it would likely happen late in the draft. If Dak improves his passing accuracy does Garrett get the credit, or does Kitna? Who brought in Kitna? If the offensive schemes improve and the team gets to the conference championship does Garrett get the credit, or does Moore? Who promoted Moore? I think this the season will be used to improve the offense and identify the next coach (already on staff), all of which I view as steps in the right direction. Your thoughts? Richard, I agree that this is a make-or-break season for Garrett. I thought Jerry Jones would give him a contract extension, especially after the Cowboys made the postseason. Jones intimated as much during his radio show, but everything changed with that poor offensive performance against the Rams. I’m sure Jones was waiting to see if Garrett could push this team into the conference title game, but the Cowboys fell short. So now Garrett has put his job in the hands of Kellen Moore. Moore comes in with high expectations and people around him believe he’ll be fantastic at the job. Moore’s biggest imperative is creating more opportunities for Amari Cooper and Michael Gallup. If Prescott improves, Jon Kitna and Moore will get some credit. But in reality, the Cowboys need to reach next year’s NFC title game to save Garrett’s job. Does Garrett “anticipate” that Kellen Moore will call plays because Jerry hasn’t told him yet? How can players respect a head coach who obviously is not in charge? You guys crack me up, but the idea that Garrett can’t do things without Jerry signing off on them is… not crazy. Moore called the offensive plays during the Pro Bowl. While that’s just a small sample, it appears when the season begins, he’ll be the guy. I think the players respect Garrett because he makes enough decisions at The Star and during games to demonstrate he’s in charge. Jerry utilized his control much more during the tenures of Wade Phillips and Dave Campo than he does now.